Convenient 3-gauge console with depth gauge, pressure gauge, and compass. 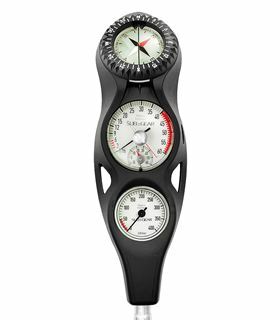 Depth gauge: 0 to 200 ft. oil-filled depth gauge with maximum depth indicator. Durable, accurate instrument to support underwater navigation. Dual-reading display is easy to follow even while swimming in a horizontal position.